Forget your old alarm system. A new startup wants to turn drones into guardian angels for our homes. Broadband at home, motion sensors and high definition video cameras led to a renaissance in home security systems over the past decade. But big problems remain in residential security, says Alex Pachikov, CEO and cofounder of Sunflower Labs with CTO Chris Eheim. Stationary cameras don’t detect would-be intruders until they are close or actively trying to enter the home, he said. Palo Alto-based Sunflower Labs has raised a seed round of $2.1 million to build a “home awareness system” that monitors homes beyond the doorway, yet is easy to install. Major home improvement retailers are selling smart cameras and smart doorbells from companies like Nest, Logitech, Ring, Canary or Oco. But these are positioned at a home’s entryways, and stationary. The Sunflower System uses a different approach. It includes what the company is calling Smart Lights and Flying Cameras. 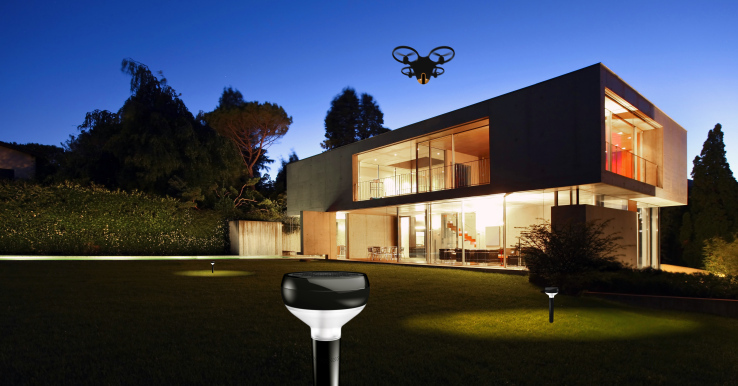 Its sensor-laden smart lights are solar-powered, and can detect motion, sounds and vibrations while illuminating the perimeter of a property or its walkways. The lights communicate with a camera-equipped quadcopter. Whenever there’s uncommon activity identified by the smart lights, the quadcopter flies to where the action is, to capture video and transmit it to the cloud. Sunflower Labs — with headquarters in Silicon Valley and Zurich, Switzerland — announced recently this new security system that detects possible threats and investigates them with a drone. The drone streams video to your smartphone, so you can see and decide if your home is at risk or not. Users can ignore alerts for routine occurrences like a spouse’s car coming up the driveway or their own kids playing basketball in the driveway. But they can opt to take a deeper look at the video if something aberrant is happening. Sunflower Labs, which is now accepting participant applications, will start beta tests in mid-2017. The startup sees itself as a complement to traditional alarms. Home security is one of those industries where products haven’t been living up to their promise. The current systems for monitoring your whole property do not enhance your enjoyment of your home as much as they make you paranoid. By tying together really smart sensors, drones, and artificial intelligence you can have a house that looks out for itself and gives you more awareness as to what’s going on. The Sunflower System can be reserved for $25 online today. The company plans to charge a monthly fee for its services rather than sell the hardware as a one-off. 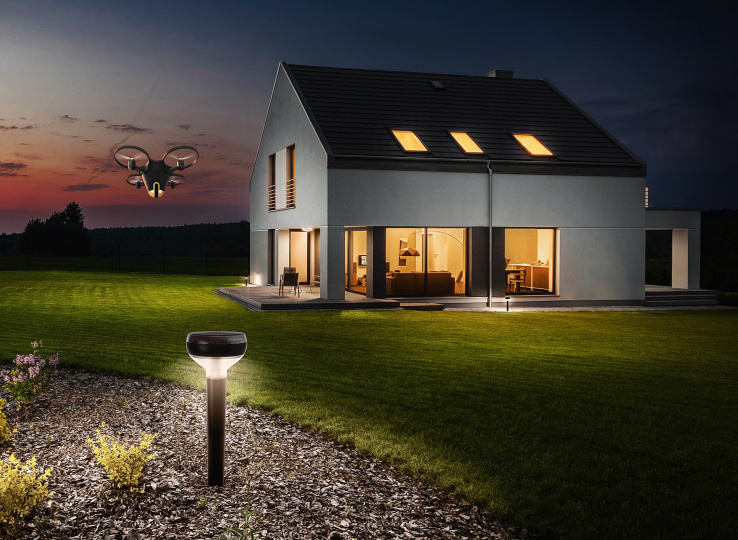 The Techie Details: The Sunflower Home Awareness System relies on the drone and a handful of in-ground smart lights to watch over your house. It detects motion, vibration and sound. By analyzing this data, the system can distinguish between a human, a car and animals. To do so, it uses artificial intelligence to identify the disturbance and determine if it’s potentially dangerous. For example, trusted visitors such as mail delivery persons will be recognized by how they approach the home and how long they stand at the front door. When a person approaches and lingers outside the back door, Sunflower Labs will send a push notification to your smartphone and ask if you’d like to investigate. If you say yes, the drone will lift off from its perch — on a balcony, deck or patio — and fly autonomously to where the suspicious person is located. The drone — 30 feet up — hovers near the visitor until you tell it to return to its nest. The app includes an option for a home owner to notify local police. False alarms are a common problem for home alarm systems. CEO Alex Pachikov expects sending the drone to investigate before calling the police will solve this issue. The system also has the benefit of keeping an eye on all of your property. Most alarm systems are set up to guard only the entries and exits to a home. The propellers automatically shut off if they hit anything and are designed to be quiet due to its broad size. “Our goal is to make it a hum, as opposed to having an obnoxious buzz,” Pachikov said. The drone currently weighs almost two pounds, but the company wants to get it down to half a pound before it ships. It also features two cameras and only collects footage of a home owner’s property to protect neighbors’ privacy. However, the drone is sure to raise safety, privacy, nuisance and regulatory concerns. New rules,which allow operators who have passed an aeronautical exam to fly drones under 55 pounds no higher than 400 feet, went into effect for commercial drones in August. And autonomous flight isn’t legal for commercial drones. Pachikov is working to integrate it with voice assistants such as Siri and Amazon’s Echo.